Hello! We have some Romanian tank destroyers that can make it into the game. Romania was an unspoken ally probably because they were not part of Tripartite Pact like Italy and Imperial Japan. While they didn’t make a lot of tanks, they started gaining grounds towards the end of the war where German and Romanian industries started cooperating more and more, such as the Mareșal tank which they wanted to make a SPAA platform using a 37mm AA gun and co-producing the tank with the Jagdpanzer 38(t) Hetzer by using German equipment. None of this became reality because Romania switched sides late in the war. This will not be it’s own tree because of the lack of tanks, instead it will be a part of the German tree with it’s own emblems and camouflage to accommodate the German tank destroyer tree. Too many non-German tanks that are part of the tree are plagued by panzer gray base colors and German emblems such as the Toldi, Panzer 58, and possibly the Turan. Just to be clear, I want a complete tech tree to come first such as the possible Swedish tree which could come very, very soon (Seb on the other hand is against it and promotes the glorious unified EU tree). Most of these tank destroyers are lightly armored and have powerful guns for their tiers, nothing really insane, but just pretty good. My past reworks were done for my own enjoyment, which have a very little chance of ever being implemented, but I hope I can implement this proposal. Some of this may be inaccurate and may change in the future, including vehicles. Hopefully, accuracy will improve in the future or I’m already accurate historicity-wise. Some things will change or be added. First off, there are a couple of base colors for these. The TACAM tank destroyers usually used the olive drab green, French export tanks used French Army green (Similar to the olive drab green), and German export tanks used panzer grey early in the war and dunkelgelb on the later German tanks. From tier 3 to 5, they will have an olive drab color while the tier 2 tank will have the French Army green. Here are some pictures. The Romanians have some main emblems that can make it into the game. Three in particular, they are Michael I’s Cross, Romanian roundel, and a white circle with a star that was used after the defection of Romania. The most interesting, in my opinion, are the Romanian roundel and the Michael I’s cross. The Romanian roundel is similar to the French insignia with red and yellow on the outer layers and it was used on R-1 tanks either on the top of the tank or the sides or even both. The colorful Michael I’s cross and the Romanian roundel were used on top of the tank for making it easier for aircraft to identify who they’re targeting. The less colorful Michael I’s cross is just white and was usually used on the side of the tank. Other insignias include St. George killing a dragon, Mickey Mouse killing a dragon (Cannot enter the game for copyright reasons RIP), unit identification numbers, inscriptions of names, etc. These insignias can also be applied to many German tanks such as the StuG III, Pz. IV, Jagdpanzer IV, Pz. 35t and 38t, Pz. III, etc. The Romanians usually kept their tanks the same color as they have recieved them. Their TACAM tanks were kept the olive drab color green and their German tanks were kept their panzer grey color and dunkelgelb. However, they do have a couple of camouflages. These camouflages are from the Germans and French. The camouflages I’m going to show you might not be actual Romanian camouflages, but information on Romanian camouflages is pretty sparse. So these are what I could find. If you can find any others, please share. They would have most likely implemented hastly made winter camo or German camo. None of these stats are set in stone, but the real life specs came from only one book. They may or may not be accurate. After the invasion of Odessa, the 2nd Armoured Regiment, which was primarily made of R-35s, sent back their R-35 tanks back to Romanian factories in October, 1941. Drive sprockets, road wheels, track links, drive shafts, cylinder heads, and various other parts were exchanged with domestic versions of them. This probably improved the life span and/or improved the reliability of these tanks with custom parts. Other upgrades proposed exchanging the armament and the turret. They proposed exchanging the turret for the T-26’s turret and the 37mm M1916 with either the 45mm 20K or the 47mm Schneider AT gun. Which can be added as a turret upgrade with less armor but more gun handling. In the end, they ended up mounting the 45mm 20K on the R-35 turret in a similar fashion to the BT-7 and T-26 tanks. This made the turret cramped and there was not a lot of room left for the ZB-53 co-axial machine gun since it was already too cramped. The downside of this, is that it carried less ammunition. By June of 1944, thirty of these vehicles were completed and sent back to the 2nd Armored Regiment. Even though it doesn’t seem like a tank destroyer, the sole purpose for the 45mm 20k upgrade was to be used as an anti-tank platform to take out enemy Soviet tanks. Plus, the Romanians and the book that I got the information from call it a tank destroyer. It will play very much the same as the current R-35, but a little bit better. Decent armor, slow speed, and a pretty good gun for tier 2. Some nerfs will have to happen in other areas (or not). When the Romanians first encountered tanks such as the KV-1 and the T-34, they found it arduous to knock out these tanks. They realized they had no tank or anti-tank gun that was capable of taking these tanks out nor did the Germans want to send any tanks/anti-tank guns to Romania because they were going to need them. Ion Antonescu proposed a solution, this solution was to copy the T-34, but it was found too hard for the Romanian industry to replicate this tank. They had many captured Soviet tanks and anti-tank guns laying around so they retrofitted some 76mm M1936 guns with more safety and the ability to be mounted on a T-60 chassis. Seventeen of these vehicles were sent to the 1st Armored Regiment to be trained in and another seventeen were ready by 1943. All thirty-four of these vehicles were given to the 1st Armored Division which was in the stage of repair; sixteen to the 1st Armored Regiment, and eighteen to the 2nd Armored Regiment, these groups made up the 61st and 62nd TACAM Companies. The penetration is adequate for it’s tier. It will have bad to meh acceleration, decent to good gun stats, paper armor, great DPM and a sufficient top speed. Definitely, the weakest link in the small mini-branch. After the poor performance of R-2 tanks (Pz. 35t) against the Soviets in Stalingrad, it was clear that they were still needed even if the performance was abysmal. In December 1942, a project led by Constantin Ghiulai was started to upgun the outdated R-2 tanks to mount a 76mm M1936 with a casemate that was made out of BT-7s and T-26s. It was capable of penetrating a T-34 from a range of 500-600 meters with Romanian-made ammunition that was similar in performance to Soviet ammunition. This 76mm is the same stock gun that was present on the SU-76M (ZiS-3) at tier 3 and the same gun as on the TACAM T-60. So if this gun is weak, why is it proposed at tier 4? The reason for this is that the 76mm M1936 was replaced with a new 76mm M1941 (F-34), which was better in overall performance. After twenty of these vehicles were built, it was decided to not produce them anymore until they could upgrade the armament. The armament that was proposed was a 75mm Reșița M1943 AT gun and a German 8,8cm gun (Most likely the L/56). The 75mm Reșița AT gun was a very capable gun with 100mm of penetration at 500 meters angled at 30 degrees. So I’m estimating the penetration to be about 130mm at 100 meters. The gun incorporated features from the PaK 40 and the M1936 Vickers AA which made a good combination. Anyways, the tank saw service defending Bucharest and Ploiești from the Soviets (or failing to, because the Soviets won). All twenty were knocked out, but one survived and is now sitting in the Muzeul Militar Național in Bucharest, Romania. The tank itself is not that good, but armament-wise it will be excellent. The 76mm M1936 will be the stock gun and you can choose between the 8,8cm Flak 37 if more information comes up or the 75mm Reșița AT gun. The 75mm will perform very good while the 8,8cm Flak 37 will have less DPM and worse gun performance. Overall this is a decently fast, low HP/T, paper armor, glass cannon. During mid-World War II, Antonescu believed the shortages of equipment could be made up with a light tank destroyer that the Romanian industry could produce. This tank was the Mareșal tank which translates into ‘Marshall’. The tank could mount a 75mm Reșița AT gun which was capable and a Soviet 122mm M1910/30. The first prototypes were made on a T-60 chassis which was the M-00 to M-03, they were armed with a Soviet 122mm 1910/30 while the Mareșal M-04, M-05, and M-06 with the LT-38-like suspension were armed with 75mm Reșița M1943 AT guns. The first prototype (M-00) was tested at the Sudiți proving grounds. There was skepticism surrounding this tank during the trials and the trials revealed several faults. It did however, pass the trials and further development continued. Development of this tank widened and lengthened the chassis and improved structural support. While development was going on, Ion Antonescu attended a demonstration of the new 75mm Reșița M1943 AT gun. He was impressed by the qualities of the gun and one engineer proposed replacing the howitzer with it. Ion Antonescu bragged about the project to Hitler which most likely influenced the design of the Jagdpanzer 38(t) “Hetzer” tank destroyer. Since Germany had a stronger industry and LT 38 parts were more easily available, the Jagdpanzer 38(t) went into service before the Mareșal. The Mareșal was first powered by a Ford V8 85 hp engine then a Buick 120 hp engine and after that a Hotchkiss H-39 120 hp engine (a thousand of these were ordered). Since the Germans liked this tank so much, they planned to give them the Hetzer’s Praga 160 hp engine and even went further to plan to joint produce the Mareșal and the Hetzer while giving it a new 220 hp diesel engine and German-made parts. However, these proposals were halted since Romania defected to the Soviets. After the invasion of the Soviets, all Mareșal prototypes were confiscated and no one knows where they went or what exactly happened to them. How will this fare in World of Tanks? I think it will perform very much like the StuG III and the E 25 mixed together. The Mareșal is extremely small as you can see in some of the pictures so it’ll obviously have very good camo, possibly, one of the best in the game. However, it will vitually have no armor and HE will wreck this tank in no time. The mobility is rather nice with a 160 hp Praga engine powering it. Maybe a Tatra Typ 103 220 hp diesel engine but it’ll probably make it a bit overpowered (Seb: considering the armor, not really). The armament this tank gets is the same as the TACAM R-2, but with improved stats. The mobility is great, the top speed will be good and the hp/t will be good. Overall, this tank will be very competitive. More specific information of these tanks will come in the future (Probably, if I feel like getting off my arse). There are enough tanks for the EU tree even non-swedish, but only if WG does not destroy it by implementing more Swiss premiums. RIP Hungarian original branch, but I think that can be somwhat fixed. They could put the Toldi IIAK in the place of the Toldi III, but the question is how historical would it be. If just Romania defected later… I know the Soviets needed to win but we defected the wrong way for both us and Germany. I don’t really care about where Transylvania is as long as we can live in peace. I also feel a bit sad because Hungary does not have proper ethnographic borders. I agree a bit more needs to be be done, the Romanian border for example is a simple line, but originally very inaccurate (hungarians/romanians on wrong sides). For example there is a Hungarian part in the Ukrainian Transcarpatia. You guys deserve that IMO, just like we deserve the Romanian part of it. Great, I welcome Romanian tanks as a part of Euro tree. I am willing to lose Swedish tree in favor of Euro!!! Hell nawh! i want my Swedish tree! Why not, no one forces you to play ony of the tank you find uninteresting. There might be people who would like to play with those tanks. But Hungarian tanks look pretty badass (more than Swedes & Czechs). More diversity = material for historical battles. Low tier Hungarian tanks look like Swedish and Czech tanks, high tiers look like German tanks, but it doesn’t change the fact that some are really looking badass. Yeah, I like the look of the Tas and the Tas TD, I would definitely keep those if they would be researcehable. Hungarian 44M Tas ( possible tier7 medium ) is badass. Okay New Zealand is next. Schofield tank ftw. Yea, well here’s the thing – new tanks to grind through and fight against is what keeps the general long-term player population invested in the game. It sure ain’t the only thing, but it is the most important and universal one. You know the problem with this line is very simple, WG has no interest in lines that cant reach tier 10. You would be better of making a proposal to implement these as premiums. I’m willing to compromise if that were the case. There is a possibility of making a 2nd small TD line which I’m okay with all of them being prems. We can always try. I am pretty sure WG wants to make these premiums too. We can probably make it go to tier 10. There are some higher tier Romanian TDs. But a lot will have to be copies. While it would be cool to have these tanks in the game, the stats you gave them at t3 and t4 are definitely OP. There would be horrendous power creep compared to the equivalent German and Russian TDs at that tier (Marder II, Marder 38T, SU76 and SU85b), particularly the Germans. Not really OP if we use fewer/historical guns. The guns stats for them are very good but its balanced by the fact that the anks themselves are very weak. The TACAM T-60 has a horrible HP/T with almost no armor. Same with the TACAM R-2. Anyways, none of these stats are set in stone. Not sure if we are looking at the same tanks. Tier 3 is slow and lacks penetration, has no gun depression, the accuracy is not good for a TD, only half decent thing is DPM and view range. Tier 4 has low-ish DPM compared to other T4 TD’s, again is very slow, accuracy/aimtime/gun depression are bad too. Only good thing is penetration. To me they actually seem inferior to current T3 and T4 TD’s. This Mareșal tank looks like the lovechild of the Hetzer and the E 25. With even less armor. Is a little baby! Awww! Hey, Tenky, when will you make an article about Hungarian tanks? Maybe. I’ll be accused from SS of stealing articles or even ideas… Maybe in the future. Please do. I read all of Karika’s writings, if you can put something together like he did, added with your own plans, ideas and views, that would be awesome. Looking at his proposal, I can probably make a full branch with a couple of copies. We may cover obscure Hungarian tanks if we find any. IDK. Oh, I already have a joke tank for tier 10: the Soviet provided T-72! The same as the T-62A, just even more shittier! But on a serious note, making a Hungarian mini-branch in the German tech tree would be okay with me, if we got the actual insignias and camos. Of course. Especially since IRL the Hungarian tanks got style. On the left side are the tanks actually used by the army, on the right are the experimental,prototype and planned vehicles. I would like to point out how the rightmost, bottom vehicle, which seems to be the only real photo and not a drawing, is actually an artillery. We have everything! It is also mentionable how the Tas Páncélvadász (Tas Tank Hunter… or rather, Panzerjäger, since we were aligned with the Axis) is basically a mix of the Jagpanther and the Jagdpanzer IV! 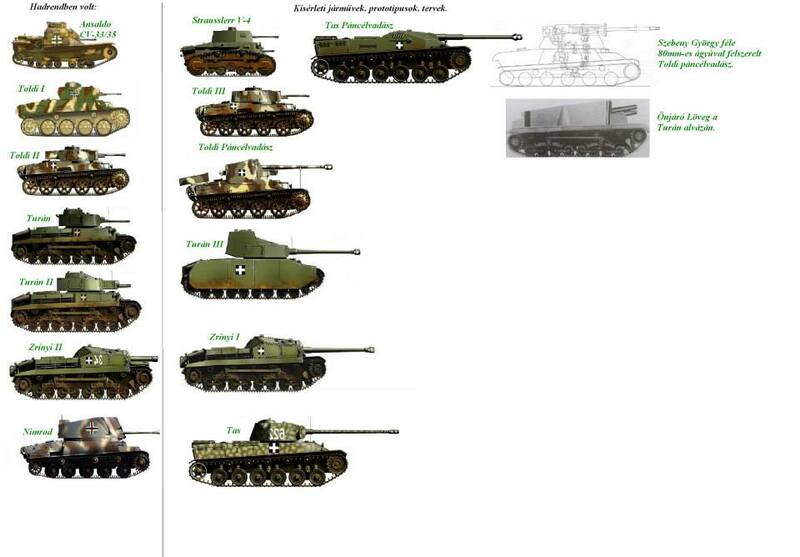 The Zrínyi I and II are about the equivalent to the StuG III, with different armament (really, the gun is the only mentionable difference), and the Turán I and II are roughly equal to the Pz. III! This would make the Turán III equal to the Pz. IV, and leave the Nimród about the same as the Marder II, while the Toldi Páncélvadász as the Marder III. And the Tas? Something neat! If they can’t work with this, then Wargaming is an official bunch of imbecils. Yup Karika is the author of Hungarian articles on SS’s site. lennél olyan kedves, hogy segít nekünk a cikkeket? It’s time they get rid off this to tier 10 Bullshits. Ok so it is a backup.